When I was a kid I loved the idea of comic books. Super heroes were cool. Spiderman in particular. But the reality was I didn’t get enough pocket money to easily afford comic books, especially on an ongoing basis. It was also difficult to find a newsagent that reliably stocked particular series. So, besides a few Phantom comics that inevitably came with Christmas presents, I really didn’t get into comic books. When I was old enough to get a part time job, it seemed that the comic book phase had passed me by. I remember spending a few weeks trying to work out which Spiderman comic was the actual Spiderman comic and eventually I just gave it all up as being too complicated. As a result I have a functioning knowledge of superhero lore, based mostly on various animated TV series, but scratch the surface and my lack of depth is instantly revealed. So, inspired by a combination of childhood regret and reading some of Tansy Rayner Roberts excellent blog series on female super heroes Where the Wonder Woman Are, I decided to read the Astonishing X-Men run written by Joss Whedon. Plot summary: A group of X-Men (Cyclops, Wolverine, Shadowcat, Beast, Emma Frost) has started up the school for mutant children again. The overarching plot involving alien conspiracy, someone back from the dead, prophecy and a lot of blowing things up. It was a fun experience. The series contains a nice, bounded story arc. 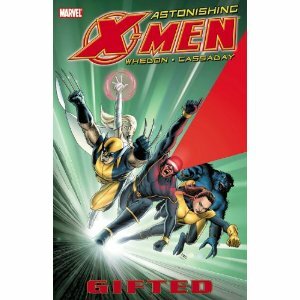 There are some bits where having a broader knowledge of what else has happened in the X-Men universe would probably enhance the reading experience, but generally speaking you could fill in the gaps with even my cursory knowledge. Reading comics is a very different experience. It took me a few issues to get to the point where I could “seamlessly” read dialogue etc – at first I kept getting pulled out of the story to try and work out who was saying what. Once the act of reading became more intuitive, the combination of artwork and dialogue made for a very immersive environment. With the relatively short length the story itself wasn’t very sophisticated and a lot of the emotional depth seemed to rely on the assumption that the reader had a long history of interacting with the characters. The story itself is quite epic in scope, aided by the artwork to give that extra oomph. I enjoyed it well enough, but I would say it was broad and shallow. The various story arcs come together well, with satisfying resolutions to most plot questions. Whedon’s dialogue is great with some fantastic one liners and the some of the plot elements were quite reminiscent of his other work. I also used it as an opportunity to try reading comics on the iPad. I then realised that because of the aforementioned lack of comic reading I didn’t actually have anything to compare it to. Still, the iPad does seem like an excellent way of consuming comics. Easy to access, just the right size and form factor.